Today, we live in a different world. We diversify. We use AdWords and Bing Ads. We create identities across social platforms, and we promote via Twitter, Facebook, Instagram and Pinterest. No longer are sites living and dying by their Google Rankings. Organic is no longer one of the cool kids. Organic is passé. Or is it? Diversification is a must, and — if we are smart in our digital marketing plans — we no longer live or die by Google’s hand alone, but have we forgotten about our organic listings and how beneficial they can be? …The clear champion of website traffic is organic search. 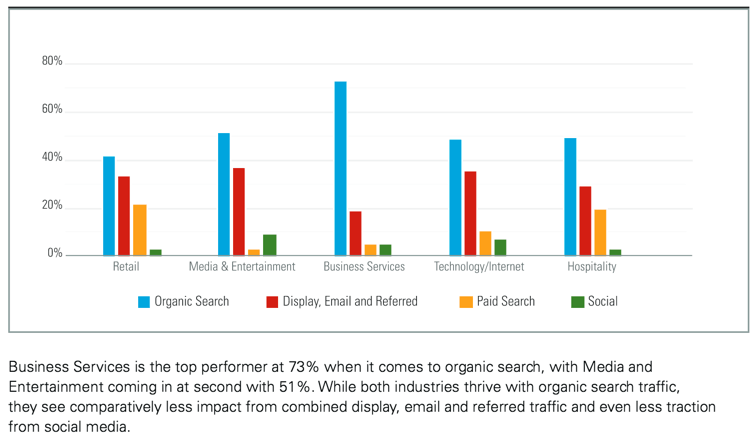 Overwhelmingly, organic search trumps other traffic generators, driving 51% of all visitors for both B2B and B2C businesses. Yet, is this the right direction? With the shrinking of organic listings and the push below the fold across many SERPs, is organic still worth it? Here are four reasons why you should not overlook your organic listings. However, we do find that by combining channels we can outperform either channel by itself. So if you are neglecting your organic listings, your paid are not doing as well as they could, either. You are leaving money on the table in both organic and paid search. When auditing sites, we often see that the client is getting as much as 40 percent to 60 percent of their traffic from Facebook. This traffic is sending their visits through the stratosphere. Yet their Google traffic is low — some of the lowest we have seen for sites of these kinds (typically publishers). When I see this, my brain hurts a little. Yes, the love affair with Facebook traffic is very real and occurs for a good reason. A site sending you millions of visitors via a single referral source is a marketer’s dream come true. Well… it is until it isn’t. With Facebook (or any social media site), you are working inside a closed system, a walled garden. This means that while your section of it may be flourishing, you have no control over how that garden gets fed or if it gets watered at all. What if Facebook decides that you no longer get to show off that garden of yours? What if Twitter decides to personalize the feed? What if Pinterest cuts off your affiliate links? These questions are very real because all of these have happened or are in the works. When you are using social media platforms for your site traffic, you are at the mercy of that platform. If Facebook cuts organic viewing, you have to pay. If Twitter decides to segment the algorithm, how do you get seen? And if Pinterest removes all affiliate links, how do you replace that traffic? When you don’t have control over the environment that’s driving your revenue, you may wind up with a hefty advertising bill to generate traffic that is lost when the company changes how the platform surfaces your content. Generally, these changes happen overnight or over a few weeks. That is not much time to adjust, especially for large companies. But Google Does This Too, Right? Of course, this makes perfect sense. If I come from my Facebook feed, I am likely to view one page and leave. What we see is that these site visitors generally view between 1.2 and 2 pages. Facebook is meant to drive article visits, not overall site traffic and customer loyalty. Twitter is meant to promote customer loyalty, not create post traffic. Pinterest users hardly leave the site unless you are selling something. In that case, paid ads are offering the user a reason to come visit, but not necessarily a reason to come back. The issue with paid referral sources, whether Google AdWords or Facebook Advertising, is that the traffic only lasts as long as you feed the meter. Pull your money, and you will see an instant dip in traffic. As I already mentioned, these users are not seeking you out; you ran across their path and they thought “Oh, cool, something I need right now!” If they have an excellent experience on your site, they may come back, but the ratio of retained visitors from paid is low in the sites we see. When you’re paying for your traffic, it is like renting. You get an immediate action, but there is no long-term buy-in from most of the visitors you get this way. With organic search, the user mindset is different. In that case, the user is looking for you, or at least what you sell/offer/publish. When they find you, if you provided an excellent experience, they often come back. If you are an unknown brand, repetitive appearances across results can start to increase brand recognition and brand loyalty. If you get into the Knowledge Graph, you are the on-page authority in the result. In addition, if you invest in organic, you can, at times, lower that investment to maintenance levels or even take a break if needed. You might decide to take an “organic break” and shift that money into immediate “last minute” sales through paid advertising. Your organic will not suffer, and your money will generate additional traffic. When you do this, if the site is still doing what it needs to do by producing content, keeping a tight rein on technical issues and monitoring its inbound link profile, you will not generally lose any significant amounts of traffic, unless you’re in a highly competitive industry, or if you changed something that damaged your site in Google’s eyes. You cannot do this with paid. When the money goes away, so does the majority of the traffic that came with it. While you are reveling in all your Facebook visits and paid advertising, don’t forget to invest in your organic results. These results will sustain you during those times when you cannot put more money into your paid budgets. Diversification is good, but organic still rocks. Make sure you don’t neglect yours.